GOKPOP | Exclusive K-News in Malaysia & Singapore: Will Running Man's Ji Suk-Jin, Yang Se-Chan, Brown Eyed Girls' JeA & Infinite's Sungjong able to sell out all the products and return to Korea? 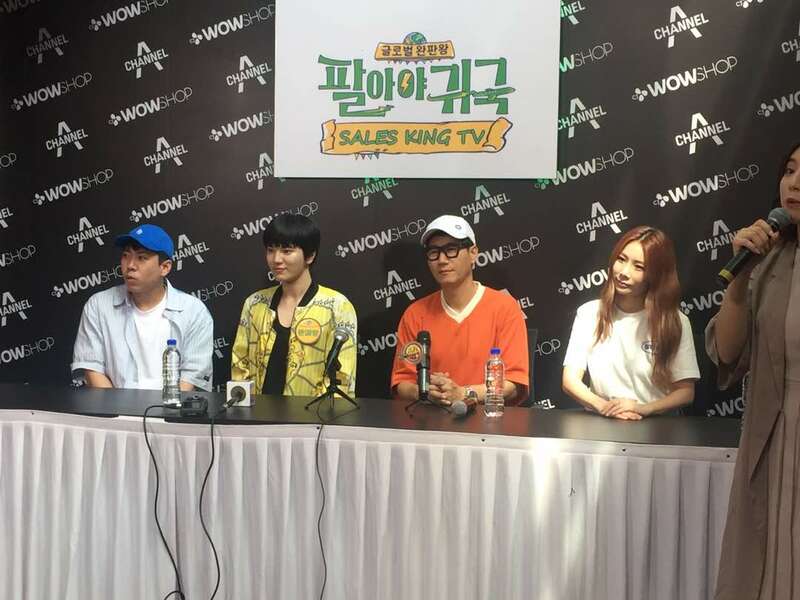 Will Running Man's Ji Suk-Jin, Yang Se-Chan, Brown Eyed Girls' JeA & Infinite's Sungjong able to sell out all the products and return to Korea? Hallyu fans and enthusiasts of Korean products are in for a WOW treat this weekend. Innovative home shopping platform CJ WOW SHOP, in collaboration with Korean TV network Channel A, is set to present Malaysian viewers ‘Sales King TV’, an entertaining variety show that combines selling on live television. Shot and aired live for the first time on CJ WOW SHOP segments, the programme features four well-loved Korean celebrities as they take on the challenge of promoting and selling a series of interesting products on air. The team includes case members of all-time favourite variety show ‘Running Man’, Ji Sukjin and Yang Sechan, who will be joined by K-pop idols JeA from ‘Brown Eyed Girls’ and Sungjong from ‘INFINITE’. Viewers will be entertained by the fun-filled antics of their beloved K-stars as they compete to sell-out all products on the show. Mr. Kim Yang Hyun, CEO of CJ WOW SHOP said, “At CJ WOW SHOP, we’re continuously seeking new ways to deliver the shoppertainment experience to Malaysians. We double down this commitment through ‘Sales King TV’, making selling and buying on television much more entertaining for customers and viewers. These Korean celebrities will be assisted by the best of the best in home shopping to complete their mission. CJ WOW SHOP hosts Zaim Helmi, Fiza Saad, Jimmy Shanley, Lily Liyana, Shinkong, Kang Chee and Pauline will join in on the action, lending their expertise of selling on live television to the special guest stars. “Leveraging Korean star power for the first time, ‘Sales King TV’ will set CJ WOW SHOP apart as a sensational media commerce platform. This collaboration follows the huge success of our recent campaign with Wanna One. We hope it will also inspire a host of exciting collaboration possibilities, while putting Malaysia as a prime market for the Korean wave products,” Mr. Kim added. Presenting customers with exclusive promotions, the home shopping variety show offers a curated assortment of high quality products including Dr Dental Care liquid mouthwash, The Yufit-V-Care Lifting Mask and one of the Korea’s hugely popular noodles, the Spicy Samyang. Customers will be able to purchase the products seen on television by calling the toll-free hotline at 1800-18-0808. They can also make purchases online by logging on to www.cjwowshop.com.my or by downloading the CJ WOW SHOP mobile app via Android or IOS.